Much has been written about recruiting and retaining millennials, as if they are a unique animal that has never been seen before. Entrepreneurs building the next wave of companies have prioritized perks like pool tables and craft beer on tap in the hunt for this next generation of talent, and in an endeavor to keep this talent. One big question on most people’s minds: Are professionals from different generations actually different? Is all this talk of millennials just hype, or is there something fundamentally distinct about this generation? And, what’s the deal with Gen Z -- are we going to be in for another decade of trying to figure out how to attract and retain these professionals when they start graduating from college in two years? In order to get at the answer to these questions, Universum Global polled 18,000 students and professionals from across the globe. Respondents were asked what they look for in companies, what their career priorities are, their fears, hopes and generally what they care about. The Head Foundation and MIT Emerging Markets Institute also contributed to this effort. As part of this research, Universum asked NextWave Hire to lead in person discussions with HR practitioners and entrepreneurs to get their reactions to the data. We also wanted to understand how people in the trenches are attracting talent across generations. Here’s what we found, along with the questions that companies still need to contemplate. This may not be obvious, but business owners and those tasked specifically with hiring need to understand their job candidates better. Just as consumers research products on a company’s site, review sites, social media, etc., before making a purchasing decision, job seekers are now researching companies for over two hours before applying for a job. Your careers page, Glassdoor page, job descriptions and more are all part of this research. The trend in understanding candidate behavior and designing candidate experiences that attract and convert the right talent falls under a rising discipline called employer branding. According toLinkedIn, companies that have strong employer brands have 50 percent lower costs per hire, and 28 percent higher retention. As most entrepreneurs know, those stats add up to massive potential savings. Professionals want freedom. This is even more pronounced with the rise of the gig economy, work from home doubling since 2005 and the introduction of labor marketplaces like Upwork, TaskRabbit, etc. 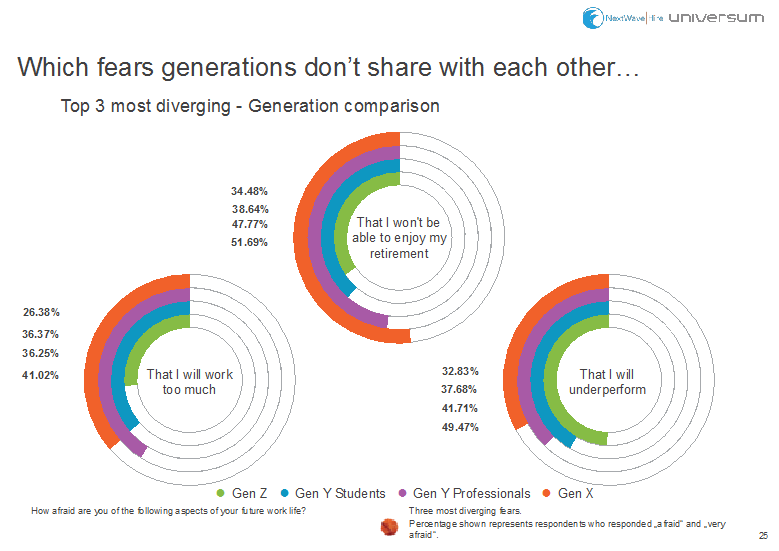 What’s interesting is that an emphasis on flexibility is true across generations, from Gen Z to Gen X.
What’s also similar across generations is the types of companies and career paths that professionals of different generations want to pursue. While those in the entrepreneurial hotbeds may think everyone wants to join a startup, this actually isn’t the case. In fact, many more people would rather start their own company. Well this may not be great news for startups, it is an interesting data point that can be used to attract and yes, even retain the right talent. This data tells us many professionals want to start a businessone day. For companies armed with this data, it’s clear that part of an employer brand should involve giving people the right skills to one day start a business. Of course, there are huge differences across generations. Unsurprisingly, Gen X is thinking more about retirement as they age. And, Gen Z has more insecurities about how they will actually perform in the workplace when they get their chance. Again, one can quickly see how these insights can help position your company depending on the type of talent that you’re trying to attract. Giving Gen Z the right onboarding and structure to make them successful is a win. Going after Gen X? Make sure you have the right benefits packages in place to empower them to meet their personal finance goals. While there has been a conversation around how to attract millennials since the end of the great recession, most companies have yet to develop cogent plans on understanding and messaging to their target job seekers. We’ll draw on the sales and marketing analogy to understand what can be done here. The best companies have taken it upon themselves to do focus groups with their current talent, and target talent to understand what motivates them. If this research has shown us anything, it’s that there are many idiosyncrasies across different groups. East Berliners are much different from West, just like engineers are different from sales people. Similar to how your business segments its customer base, and designs landing pages for each market, your career page should contain landing pages that are designed for the different groups of people you’re trying to attract. But, as one entrepreneur shared, “it’s nearly impossible to build a talent branding strategy that is as in-depth as our go to market, especially given how HR isn’t trained in using marketing-like tactics.” However, there is a new suite of recruitment marketing software that allows your business to quickly create these sorts of segmented landing pages while still integrating with your standard HR systems. As it turns out, there are large differences across generations. To complicate things, there are differences in what professionals are looking for across geographies and roles as well. As a business leader, prioritize a deeper understanding of your talent through 1:1 conversations, focus groups and data in the cases where your organization’s presence reaches beyond one geography. The next step is to design a strategy that will allow you to message effectively to each group on your careers site, social media and other talent touch points. The goal is to attract the right talent, and let the wrong people opt out. Lastly, you’ve got to make sure that your organization lives up to the branding, and can deliver on the promises you make to candidates at the top of the funnel. Good luck!